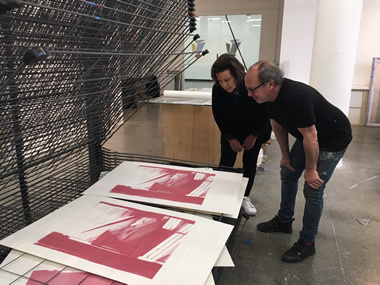 Zirin, working with Gary Lichtenstein Editions at Mana Contemporary in Jersey City, NJ to create a new silkscreen edition and a series of unique prints. "Following in the tradition of geometric abstraction, to which she makes a personal and idiosyncratic contribution, Zirin finds ample space to operate between the valences of 'pure plastic art' that was the object of Mondrian's pursuit, and of Malevich's, where 'nothing is real except feeling.' She knows her materials, but she also knows that mastering them is merely an exercise unless in so doing she transports the viewer–and herself–to a place both familiar and strange. ...her paintings are simultaneously in sharp focus and elusive, just beyond the reach of rationality." All content and images Copyright © 2009-2019 Nola Zirin nolazirin@verizon.net website by canopy studios,inc.